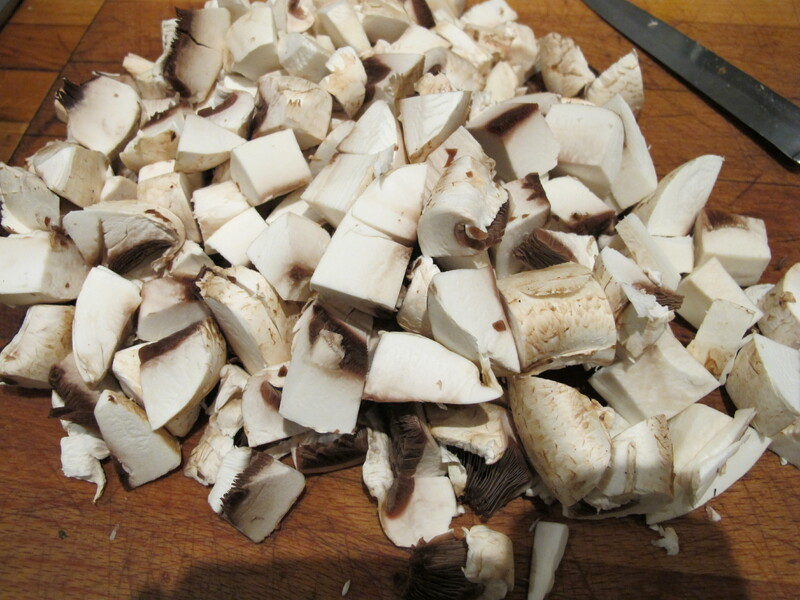 The meatiness of mushrooms makes them ideal for making soup. Not much else is needed, though the hint of nutmeg chimes nicely with the festive season. 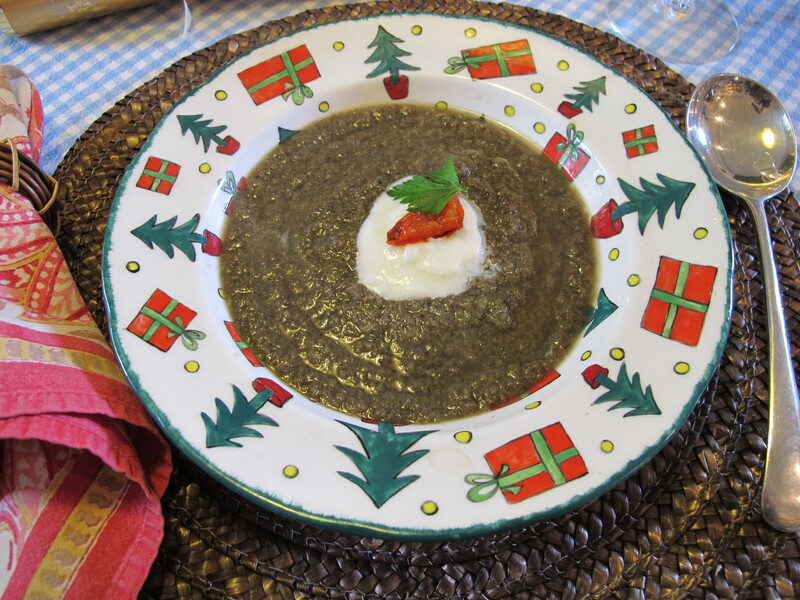 This is adapted from a recipe in Carolyn McCrum’s still very handy The Soup Book, published over 30 years ago. Mushrooms, garlic and parsley with a sprinkling of nutmeg and seasoning. It’s simple, quickly done and very tasty. Ideal for Christmas evening perhaps? 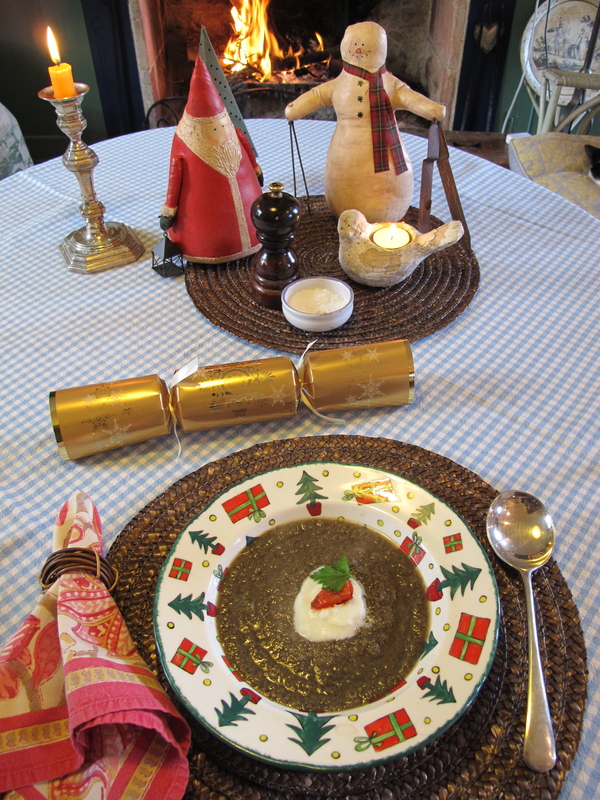 Meredith makes the very best of a less than photogenic soup! 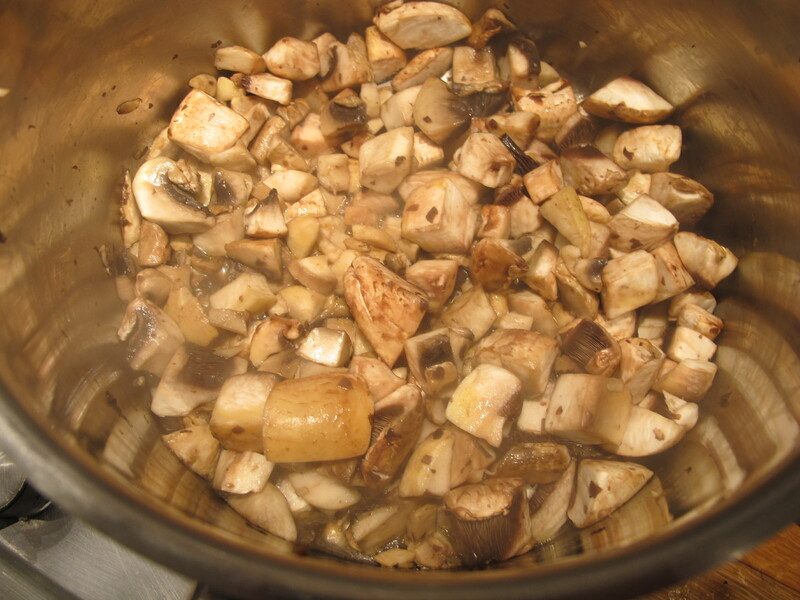 Add the mushrooms and stir thoroughly–the oil will quickly be absorbed. 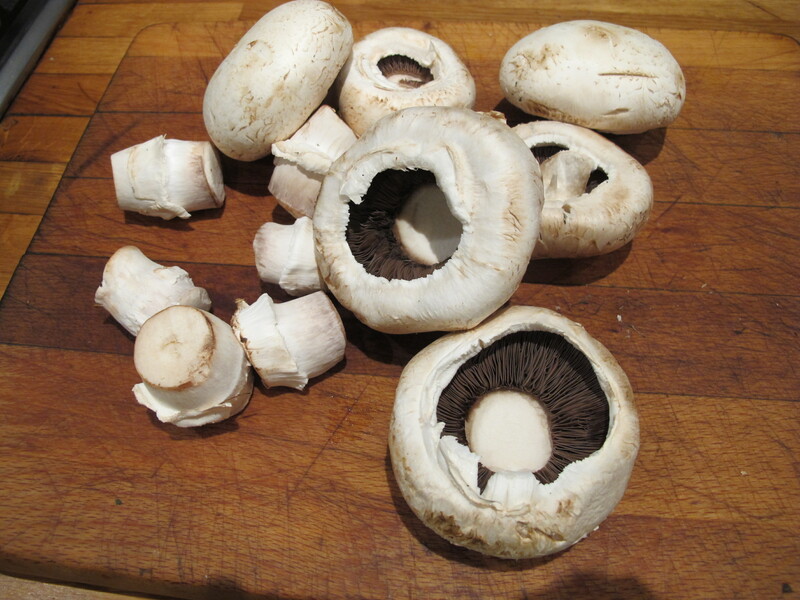 Cook over a low heat until the mushrooms start to release their liquid. Add the garlic, parsley and nutmeg. Season with pepper and a little salt. Add the stock and bring to a simmer. Cook gently for 15 minutes. Let it cool a little before liquidising and check the seasoning. Sprinkle each bowl with a pinch of parsley. The pictured version was a tad too thick we decided–add a little more stock if you like. Oh bliss mushroon soup my favorite soup of all, this looks very teasty, with just the right decorative setting It will hit the right mark on a damp cold snowy night in by the fire.Thank you. Lovely photo. Perfect placemats for the color of the soup. The cracker is a nice touch. By the way, is that Beau’s ear top right? Does he never tire of being photographed? I see Beau catnapping on the chair, too! Robin, I was a rather boring vegetarian before your recipes. My family is very happy now that you have helped us turn vegetables into new ways of deliciousness. I always made cream of mushroom soup but we can’t wait to make it this way. We are having it this coming week. We love veggies and you have just put the fun in fungus! And you present the food so beautifully. Thank you, Kathy!-the nutmeg helps. I like this recipe very much . I love mushrooms, I eat them very often. Bye Mr. Robin I Wish merry Christmas to you and your wife. This is wonderful!! It was so easy! I doubled it and it all went. I tried it with asparagus that was great too. I also tried it with spinache, not so good. But the mushroom soup is the best i’ve ever had. I am a poor cook and this was sooo easy!! Carolyn McCrum was my mother. She made soup every Sunday for lunch and when I make it now I remember her. Hello, Anna. Your mother’s soup book is a gem. Thanks for leaving your comment; I shall–carefully, it’s fragile now–leaf through it again this winter. Carolyn McCrum was my mother and she made soup every Sunday for lunch filling our house with delicious smells. I am always reminded of her when I make soup for my family.